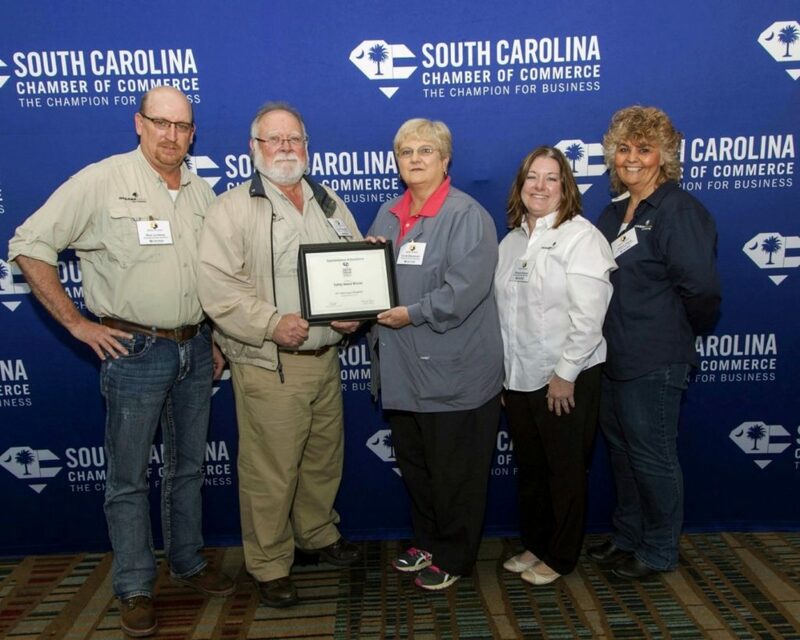 (Kershaw, S.C.) — For the third consecutive year, OceanaGold Corporation’s Haile Gold Mine was recognized for its exemplary commitment to safety with an Excellence in Safety Award from the South Carolina Chamber of Commerce. The statewide safety award is presented to companies that achieve a commendable lost workday case rate during the previous calendar year. Haile Operation team members were honored during the annual Safety Awards Luncheon which was held on Thursday, March 29 at the Columbia Metropolitan Convention Center in downtown Columbia. Employees pictured left to right holding the 2018 South Carolina Chamber of Commerce Safety Award for OceanaGold’s Haile Operation: Ron Lindsay, Scott Hartness, Cindi Blackmon, Pam Keeney and Sherry Davis. Haile Gold Mine employs 500 personnel, the vast majority of whom live in the community. Along with creating a safe workplace that allows employees to grow and succeed, the company also invests in the local community. OceanaGold’s Haile operation has invested $225,000 in social programs and injects nearly $3 million every year into the local economy through labor and the purchase of goods and services. OceanaGold’s Haile Operation is based in Lancaster County, South Carolina near the town of Kershaw. Haile is the only operating gold mine east of the Mississippi River. Haile’s parent company, OceanaGold, is headquartered in Melbourne, Australia and is one of the premiere gold producers in the world. For more information, visit: www.hailegoldmine.com or www.oceanagold.com. Gold Mine, a top-tier asset located in South Carolina along the Carolina Terrane. The Company expects the Haile Gold Mine to commence commercial production in early 2017. OceanaGold also has a significant pipeline of organic growth and exploration opportunities in the Asia-Pacific and Americas regions. OceanaGold has operated sustainably over the past 26 years with a proven track record for environmental management and community and social engagement. The Company has a strong social license to operate, and works collaboratively with its valued stakeholders to identify and invest in social programs that are designed to build capacity and not dependency. In 2017, the Company expects to produce 550,000 to 610,000 ounces of gold and 15,000 to 17,000 tons of copper at All-In Sustaining Costs of US$600 to US$650 per ounce. Certain information contained in this public release may be deemed “forward-looking” within the meaning of applicable securities laws. Forward-looking statements and information relate to future performance and reflect the Company’s expectations regarding the generation of free cash flow, execution of business strategy, future growth, future production, estimated costs, results of operations, business prospects and opportunities of OceanaGold Corporation and its related subsidiaries. Any statements that express or involve discussions with respect to predictions, expectations, beliefs, plans, projections, objectives, assumptions or future events or performance (often, but not always, using words or phrases such as “expects” or “does not expect”, “is expected”, “anticipates” or “does not anticipate”, “plans”, “estimates” or “intends”, or stating that certain actions, events or results “may”, “could”, “would”, “might” or “will” be taken, occur or be achieved) are not statements of historical fact and may be forward-looking statements. Forward-looking statements are subject to a variety of risks and uncertainties which could cause actual events or results to differ materially from those expressed in the forward-looking statements and information. They include, among others, the accuracy of mineral reserve and resource estimates and related assumptions, inherent operating risks and those risk factors identified in the Company’s most recent Annual Information Form prepared and filed with securities regulators which is available on SEDAR at www.sedar.com under the Company’s name. There are no assurances the Company can fulfil forward-looking statements and information. Such forward-looking statements and information are only predictions based on current information available to management as of the date that such predictions are made; actual events or results may differ materially as a result of risks facing the Company, some of which are beyond the Company’s control. Although the Company believes that any forward-looking statements and information contained in this press release is based on reasonable assumptions, readers cannot be assured that actual outcomes or results will be consistent with such statements. Accordingly, readers should not place undue reliance on forward-looking statements and information. The Company expressly disclaims any intention or obligation to update or revise any forward-looking statements and information, whether as a result of new information, events or otherwise, except as required by applicable securities laws. The information contained in this release is not investment or financial product advice.